Managing Partner of “Lavrynovych and Partners” Law Firm Maksym Lavrynovych together with the Executive Partner Iryna Marushko met with the Extraordinary and Plenipotentiary Ambassador of the Republic of Macedonia to Ukraine His Excellency Mr. Stole Zmeykoski and General Director of the General Department of bilateral cooperation with countries in America, Africa, Asia, the Middle East, Eurasia and the Pacific Region of the MFA of the Republic of Macedonia Mr. Nenad Kolev. 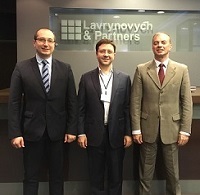 During the meeting, the parties reached an agreement on a joint event, in which all interested clients of the “Lavrynovych & Partners” can participate. During the last few years Ukrainian business has shown great interest in investment-oriented legislation, highly appealing tax system and the possibility of protection of the investments in the Republic of Macedonia. The Republic is one of the positive examples of effective implementation of the Association Agreement with the EU, which the country signed in April 2001. Currently, Macedonia is a new and promising direction for the direct investment, and offers simple conditions of acquiring the citizenship for investors and their families. The details of the event shall be informed additionally. We will be glad to see all interested people.